This is an outstanding work and one which seems no longer to be in print but a few second hand copies are available. Dr Grazioli clearly, succinctly and gently presents FACTS on the undisputable. He honours the written Word of God as infallible, and answers some frequently asked questions on the relevance of the Levitical laws to our day, and brings New Testament Scriptures in to the light. 3. Is AIDS God’s Judgment on Homosexuals? 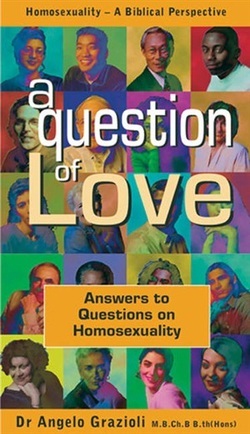 · Dr Grazioli lays out Scripture, working with the original Hebrew and Greek, to prove that you cannot be saved and a practising homosexual at the same time. Dr Grazioli makes the case for homophyllic love – love of a woman for a woman, or man for a man, which does not involve a sexual relationship or even a sexual inclination. He makes the clear case in favour of strong love between the same gender which is not in any way profane. CM: I would add my reserve to Dr Grazioli who advocates that it is fine for homophyllic friends to co-habit. For me, the Scripture regarding “avoiding the appearance of evil” would prevent me from supporting this view fully. Specifically, if homosexuality has been part of one’s past, I would propose that homophyllic co-habitation is not advisable. · He makes an excellent point regarding the reformed homosexual and the subject of heterosexual marriage: he releases the reformed homosexual from the obligation to marry. CM: I cannot agree more: Too often, it is thought that a former homosexual; saved, delivered and set free, must marry to prove his/her freedom. Marrying and producing children is not ‘proof’ of a life set free. · On the question of which laws apply to today, Dr Grazioli, brings forth an excellent explanation of the five kinds of laws: Physical Laws, Moral laws, Civil Laws, Ceremonial Laws and Circumstantial Laws and goes on to point out that: The penalty for homosexuality was death, underscoring the severity of the transgression, whilst for eating shellfish – you were only unclean until the evening. · On the subject of cross-dressing he gives the least satisfactory response. He simply states that transgender dressing does not mean that that person is a homosexual. CM: This one needs a full response . . . article to follow . . .
· Dr Grazioli says: “Once out of the closet, it is difficult to get back in. . .” Yes, difficult, if not impossible for the person to strive in his/her strength, but possible with Christ! CM: As with much material out there, I am again left with one desire: to read of the vital born-again experience: that meeting which each and every one of us must have with the living, Holy God, for when one has met the Saviour – truly met the Lord Jesus Christ — many, and most questions fall away. Meeting the Man of Calvary and allowing His life to fill you, will give you a desire to walk and live as Christ walked and lived. With God’s Holy Spirit in you, and the Word of God before you, you will have no shadow of doubt as to what is permissible and what is dismissible! Overall though, this transcript of a seminar is a rare and vital piece of literature for anyone researching the subject. 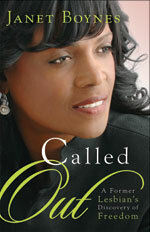 Janet says: "Let me share my testimony as I tell how God called me out of homosexuality. I believe that what God has done for me, He can also do for you. If you are struggling with homosexuality, I'm living proof that there is hope through Jesus Christ. I can offer insight and help provide resources for those seeking a way out." Please join us in praying for Janet and those associated with her ministry as they face much opposition as they share God's heart on this subject. Outstanding, sound, Biblical. . . This may seem to be for the more serious reader or more serious study but it reads so well and is easily accessible to all levels. Andreas Kostenberger's book is a good reference book for all families who desire to build godly homes and fulfill God's Word.